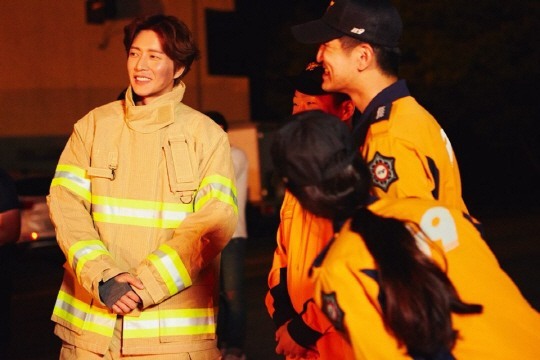 Park Hae-jin volunteered to raise awareness on fire safety and help improve working conditions for firefighters. The actor appeared in a public service announcement promoting fire safety and participated in the Hands for Hero campaign, a donation fund to support firefighters who do not receive proper care. Park’s agency, Mountain Movement, covered all costs required in the process. Park filmed the PSA on Thursday, receiving praise for his enthusiasm despite the scorching heat. “It was an honor to experience the firefighters’ work even for a little while. I would like to dedicate this video to all Korean firefighters,” he said. Park will also model for an annual firefighters calendar, as part of a campaign that was initially suspended due to a budget shortfall. His friend and renowned photographer Lee Su-jin has come on board to help. In 2016, Park had the opportunity to witness the inadequate working conditions of the fire department thanks to a fan whose father was a firefighter. Since then, he has actively participated in volunteer work related to the issue. The PSA video is to be played at government offices, on outdoor screens and on TV starting from September. The calendar will go on sale in November, with all proceeds going to help firefighters and their family members who are not subject to government care.